Happy Friday, Whistlers! I wanted to wrap up summer with this lovely and airy Summer Festival Slouchy. 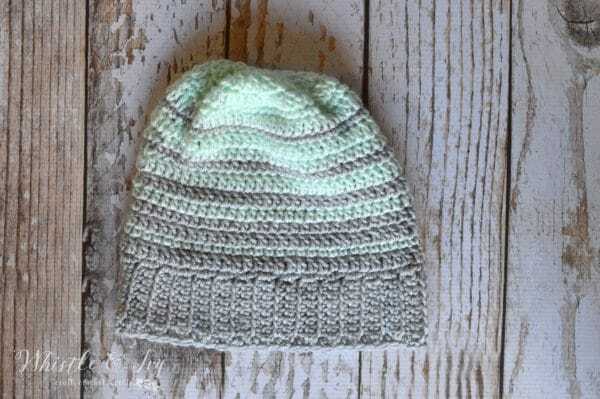 I absolutely love hats, and this light hat is still wearable is warmer weather with its granny stitch-esque stripes, and breathable cotton yarn. Note: To avoid lots of tails, you can “bring up” the yarn with each color change. Keep both colors attached to the hat and switch between them when you are switching colors, instead of cutting and rejoining. Repeat rows 7 and 8 respectively until you reach 17 total rows. 18. Ch 2. (*3 dc in same st. Sk next dc and ch. * work 3 times. 2 dc in next st. Sk next dc and ch.) repeat the entire instructions inside parentheses 5 times. *3 dc in next st. Sk next dc and ch* work 3 times. Join with first st. (64 st. This step can be a tad confusing. If it helps, you are working the shells like in step 8, but you are working a 2-dc shell after every 3 shells). This decreases the row count by 5 sts. I hope you have a wonderful weekend, my friends! 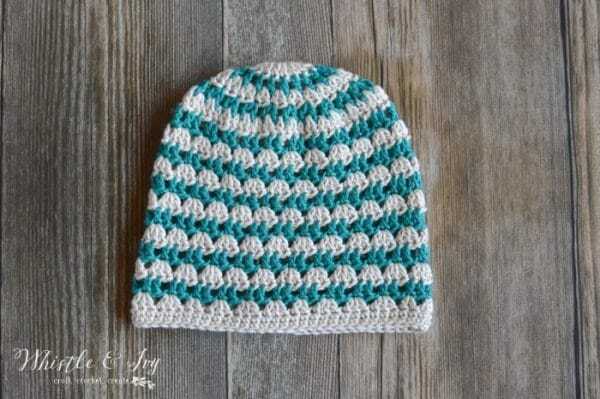 Like this free summer festival slouchy pattern? Subscribe! 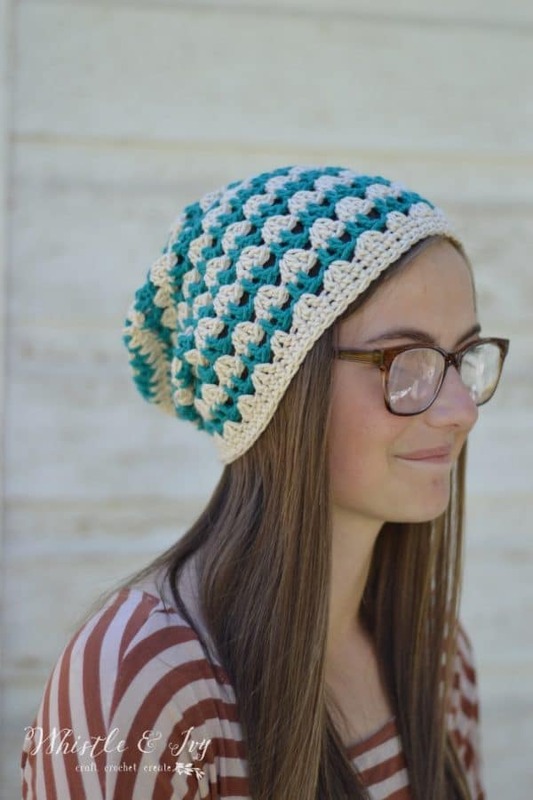 Super cute hat pattern Bethany…..as usual! I make so many of your stylish designs, so thank you for your great inspiration! 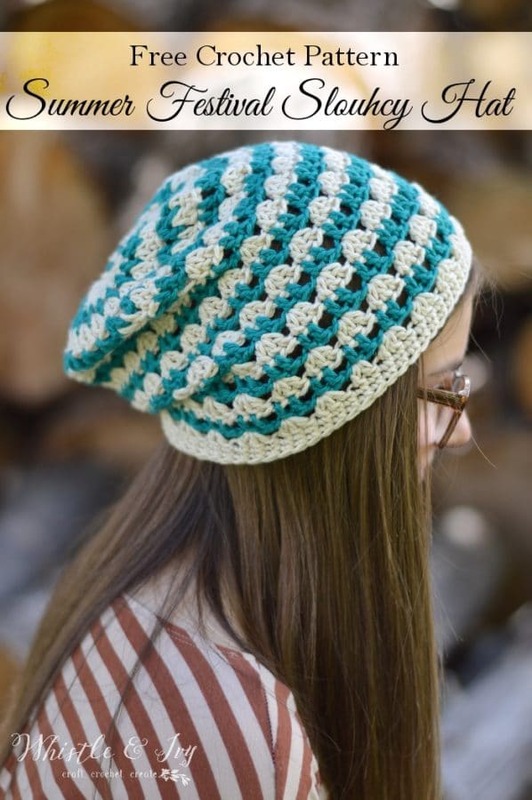 I’ll be making this hat pattern for a sweet and dear friend whose been diagnosed with stage 3 lung cancer….and she’s never smoked! I’ve bought all colors of cotton yarns and lots of bandanas. It looks so cute with a bandana tied on her head and a holey cotton hat over top! I designed many for her as she likes the short slouchies the best with a bandana. So your design is perfect for what i have in mind for her! Thx again and God bless! I love your patterns!! Really beautiful. I am trying to make the Summer Festival Slouchy and I am having trouble understanding the directions for row 6. It looks like it is asking me to make far more than 69 stitches. Row 5 and 7 make sense, just not sure what I am supposed to do for 6. Row six you will working into the spaces you made with you when you make chain spaces from the previous row, plus in between the dc’s from the previous row. Does that make sense? The first part is 10 sts, which you will work a total of 5 times, which makes 50 sts. The last part of the row makes up the remaining 19 sts. Hello!! I don´t understand file #6..please help!!! Hello! You will be working in the space between the 2 dc, not in a stitch. Does that make sense? I see I’m not the only one having problems with the pattern. I *think* I figured it out. For round 3 to get 30 stitches you want to increase by 10 which would be every other stitch. As written dc,ch1 you’re increasing every stitch. I did dc,ch1,dc and ended with 30. For round 4, 2 dc in each chain space won’t get you to 40 stitches. There’s only 10. You need to dc in the dc before and after the ch1 space. So I looked at it and pulled out my hat. Row 3 should actually have a 40 stitches count (you are increasing by 20). The next row is working 2 dc in each ch space, not increasing at all, giving it the same row count as the previous round. Does that make sense? I am so confused by step 6. I can’t figure out exactly where to put my stitches. I’ve done it over and over again and I can’t get to 69. Please help. So you will work between the stitches, similar to a V-stitch, then you will work in the ch space between the 2 dc shells. Does that make sense? Row 3 doesn’t make sense, please help if you follow the pattern I do not get 40 I get 20…. Sorry, that was a typo on my part! The row should have 30 sts. The ch is the increase on this row, You will be working a dc in each st around, but you will be chaining in between each dc, making 10 extra stitches for the round. Does that make sense? I had a lady that has crochet for 50yrs and she cannot figure this pattern out. I wish you could do a video to show it. 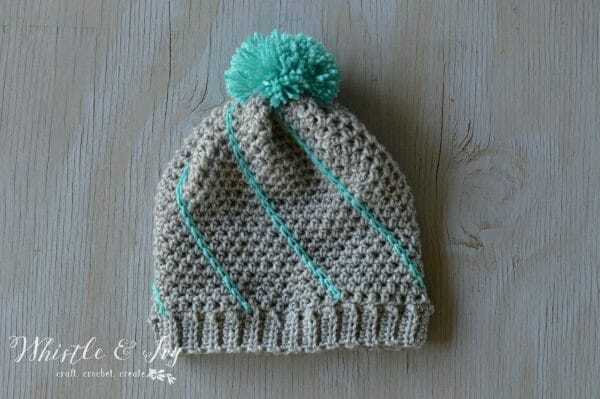 I love this hat and really want to make it. If you have specific questions, I can try to help! Wow, sorry I swear I fixed that to say 30. Sorry! This row is working a dc in each st, with a ch in between. This increases the round by 10. Could you please reright the pattern so we don’t have to keep asking you about this. I love this hat! I haven’t been able to crochet all summer long. Pinned this for later! Thanks for sharing at #HomeMattersParty hope to see you back! I love your summer hat pattern. You know, I was so sad yesterday. One of my many medical angels who saw me through breast cancer is actually a seven year ovarian cancer survivor. She has been recently diagnosed with two different types of breast cancer – one in each breast. You have given me a great summer pattern to make her a nice chemo hat. But more than that, you cut through my sadness and lightened my heart. Thank you! Oh! I am so sorry, that news in terrible. I am honored to have been able to brighten your day. Hugs.